Published: June 2, 2013 at 12:26 p.m. Updated: June 2, 2013 at 07:07 p.m. When CEO Jed York and the San Francisco 49ers announced the partnership with Levi Strauss for the naming rights to the team's new stadium in early May, the nickname jokes flew hard and fast. 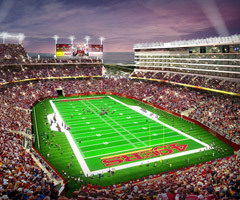 Levi's has applied for two trademarks pertaining to the 49ers' new stadium. York quipped that the best one he heard was "Field of Jeans." "Big Button Fly" and "The Big Zipper" were others suggested by the deluge of the late-night comedian want-to-bes. While we were all joking, Levi apparently was taking notes. The jean company applied for a trademark on the "Field of Jeans" phrase, Mike Rosenberg of the San Jose Mercury News reported this week. Levi also applied for a trademark of the phrase, "Win One for the Zipper," which CEO Chip Bergh joked a coach could say in the locker room. The moral of the story here is if you say anything good, trademark it -- it apparently costs $350 to apply, if you were wondering. If not someone else probably will.